﻿National Teacher Day: Calendar, History, Tweets, Facts, Quotes & Activities. National Teacher Day provides an opportunity to recognize and show appreciation for the enormous impact that this nation's teachers have made and continue to make on its youth. In 1953, an Arkansas teacher wrote to Eleanor Roosevelt about the need to recognize and honor the nation's teachers. Mrs. Roosevelt persuaded Congress to proclaim a day in May as National Teacher Day. 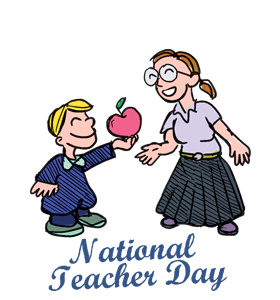 National Teacher Day is celebrated on Tuesday of National Teacher Week; this week is observed the first full school week of May each year. As of May 2012, there were 950,440 teachers, teaching approximately 58 million students in US elementary and secondary schools. Around 1944 Arkansas teacher Mattye Whyte Woodridge began corresponding with political and education leaders about the need for a national day to honor teachers. Woodridge wrote to Eleanor Roosevelt, who in 1953 persuaded the 81st Congress to proclaim a National Teacher Day. There are currently 3.2 million teachers in the US today, 1.8 million of which will become eligible for retirement within the next decade. Join 2016 #ThankATeacher campaign. Take a picture with your favorite teacher, post it on social media and hashtag #ThankATeacher. Write a personal Thank You note to special teachers. Provide picture bouquets to teachers using pictures of current students with messages attached as leaves. Hang congratulatory or thankful banners on classroom doors. Have the community contribute gifts and gift certificates for teacher gift baskets. Host a breakfast for teachers before school. Try to involve local stores as sponsors.